You can keep your business’s products organised like Lawrence and Hanson with cable racking from MACRACK. Book your free design here. When you think electrical hardware, you think Lawrence and Hanson. When you wonder how they store it all, you should think MACRACK. Beginning in 1886, L&H Group has continued to expand throughout Australia, becoming the leading industrial distributor of electrical, lighting, heating and cooling, and ventilation components to businesses nationwide. Boasting 130 branches across the country, including local branches in Capalaba, Coorparoo and Newstead, L&H is committed to providing their clients with quality electrical hardware. In order to keep their high quantity of products organised, L&H trusts MACRACK to provide their warehousing and instore shelving systems. One of the most used racking systems of L&H is our cable racking system. Also known as drum racks, spool racks, reel racks or wire racks, cable racking is a great way to store cable so that is can easily be unwound as required. 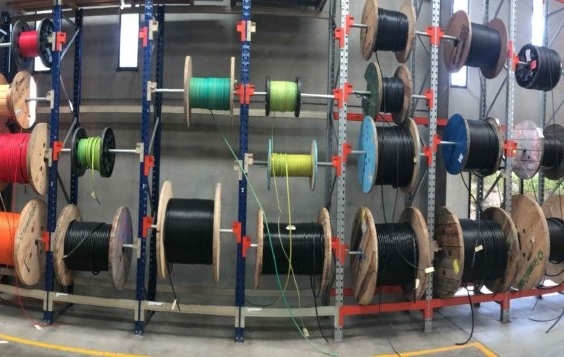 The cable drums are supported by a horizontal steel tube, allowing the drum to remain independent and able to roll while in a secure position in the racking system. Because of the size and weight of these drums, we often only design the racking system for 4-5 cable drums high. This provides maximum storage using minimum floor space. For smaller spools and reels, we often use workbenches with a built-in spool rack at the back. A company as large as L&H requires an industrial storage solution that is the same as the cable rack, just scaled down. We use the same frame and beam configuration combined with a smaller pipe to tailor a solution that best suits the needs of L&H. Conduit is an awkward item to store, and it’s often stored against a wall. This may be fine for a couple of pipes, but the more you store, the greater the force against the wall. You may soon find you have hundreds, or even thousands, of kilograms pushing against your wall creating an unsafe environment. A lot of the products L&H supply are itemised components that require handpicking. These include boxes of light switches, transistors and lightbulbs. L&H chooses MACRACK’s heavy-duty shelving in their warehouses and stores to support the weight of these items as they can rapidly build up, but still require separate storage. MACRACK’s heavy-duty shelving is the perfect solution for storing items that require handpicking, while providing the weight load capacity of industrial shelving. We use low profile beams often in association with particle board and board supports to ramp up the weight load capacity. This storage solution is ideal for L&H and most warehouses that have smaller items that add up to weigh a lot. To really maximise space and storage capacity, we create pallet storage above the shelving. This allows storage of bulk palletised items as well as picking items in the one bay. Are you considering cable racking or heavy-duty shelving for your business? Contact the experts at MACRACK to discuss the best storage system for your business.